"Savages! Brutes! Fiends! Why did I ever come to this nightmare of a country?" I'm not sure what his standing in modern culture is, or even if he remains much remembered by today's average citizen, but once upon a time, Buffalo Bill Cody stood as one of America's legendary figures. A scout, Pony Express rider, sharpshooter, Indian fighter, actor, the list goes on. He is probably best remembered for his Wild West show, which did much to cement the image of the West in American culture. That, and the mythmaking stories written by and about him, leave a legacy that is rich in potential for any artist to investigate. William A. Wellman took up the challenge in his 1944 bio-pic Buffalo Bill, to tepid results. Starring Joel McCrea as the legendary Cody, the story covers only a couple years or so of the man's life, focusing on the time of his meeting with his eventual wife Louisa Frederici (Maureen O'Hara), through writer (and Cody mythologizer) Ned Buntline's (Thomas Mitchell) conception of the Wild West show. We meet Cody when he saves Louisa and her father, a U.S. Senator (Moroni Olsen) from a group of drunken Native Americans. It's love at first sight for Cody and Louisa, and the film spends some time establishing Cody's uncultured (but honest) nature against the civilized folks from back East. While he works with the Army, Cody is still friendly with the local Cherokee, even counting the chief's son, Yellow Hand (Anthony Quinn) as a close personal friend. Quinn's performance is a real weakness; he never deviates from "mysterious noble savage" mode in any of his scenes. His sister, Dawn Starlight (Linda Darnell), teaches the local white schoolchildren and pines for Cody. Cody tries to makes the Army and the moneyed Easterners see that the Native Americans will be fine if you simply let them live in peace, but the new railroad line needs to go straight through Cherokee land, and Yellow Hand is brought in to be given an ultimatum: let us build the train or your people will be rubbed out. The Cherokee respond by going on a terror spree, kidnapping Louisa's father to use as a hostage. Cody gains his freedom by calling in a debt owed him by Yellow Hand, who responds by declaring their friendship at an end. Cody does manage to push the two sides toward a peace, and he marries Louisa, after a cute courting scene using Cherokee courting rituals. In one of the few interesting touches in the script, this scene mirrors an earlier moment, when Dawn sneaks into Louisa's room to try on a dress, in order to determine if she could be beautiful in a white woman's fashion, to capture Bill. Instead of Dawn using Louisa's ways to capture Bill, Louisa uses Dawn's traditions to do the same thing. Bill and Louisa live happily for a couple years, before Louisa's father visits with a business proposition: to lead buffalo hunts, as the skins are all the rage back East. Bill goes along with it, until he has misgivings about the extent of the hunting, which is beginning to seriously damage the buffalo population, as well as hurt the Native Americans who live off the buffalo. The Cherokee and Sioux take the buffalo hunting as an act of war and go on the counterattack. Bill and Louisa, who have just had their first child, conveniently arrive at the army base just as the troops are preparing to ride out. Bill must decide whether to stay with Louisa or ride with the Army. He chooses to ride, which causes Louisa to ditch him and leave for the East. Bill gains fame from his exploits in the battle that follows, but at a cost he doesn't expect. 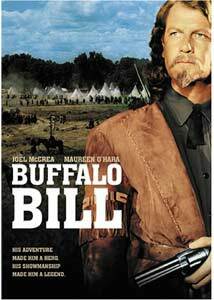 Buffalo Bill was, according to director William A. Wellman, meant to be a more cynical look at the legend of Buffalo Bill, but as Wellman described it to Richard Schickel in The Men Who Made the Movies, his co-writer decided that he didn't want an American legend to be destroyed in that fashion, so the script was discarded and this more sanitized version was produced. Wellman was somewhat ashamed, as he put it, of the finished product, in particular the end, which is set at Bill's final performance of his Wild West show. When Bill says goodbye to the audience and "God bless you," the scene cuts to a boy on crutches, who struggles up and shouts "God bless YOU, Buffalo Bill!" It's a grotesque moment, and Wellman admitted that he "turned around and damn near vomited" when he shot it. We agree on that point. Viewers should note that during the buffalo hunting sequences, there are several instances of buffalo being either tripped up or actually shot, so if you prefer to avoid movies that include animal cruelty, you may want to give this a pass. The movie is a product of its time, patronizing attitudes toward the "noble savage" included. The movie does posit capitalism and white civilization as the true villains of the film, which elevates it a bit, but in the end, the noble Indian and the roughhewn but honest Cody are simply left to do what they must to survive, which amounts to becoming the entertainment for those self-same civilized folk that worked to destroy the more honest world of the West in the pursuit of the dollar. As Cody, it's McCrea's film to run away with, but his performance is striking in its utter bloodlessness. He's too safe and non-threatening, and lacks the charisma that the real Bill Cody must have possessed to make him one of the most popular men of his day. O'Hara doesn't have much to do, but she does it well enough. The most engaging performance comes from Edgar Buchanan as Sergeant Trips, an Army lifer who provides some comic relief as the fort postmaster. This is a bland film, though, and most of the performances live down to that level. Image Transfer Review: The transfer of this Technicolor film looks pretty good for the most part, though the colors sometime fluctuate slightly and seem a tad pale. There is occasional shimmer, but overall, I was pleased. I wasn't expecting great things from the transfer, but it's pleasant enough to look at. Audio Transfer Review: Four choices here: English mono and 2.0 stereo, and French or Spanish mono. I flipped back between the two English tracks, and the two don't have a great deal to distinguish them. Both are solid if a little on the tinny side. Extras Review: None, not even a trailer. Buffalo Bill does not illuminate the character of Bill Cody in any meaningful way, and the performances are limited by the lackluster script. If you're a diehard Western fan, you might find something to interest you. Otherwise, given the bare bones DVD, I recommend renting this one first.